Arthur O(lney) Friel was born on 31 May 1885 in Detroit, Michigan, the son of George William Friel and Lucy L. Friel (Thompson). When his mother lived in Epsom, they lived in a cottage at Gossville. He was the Honor roll from 1896–1897 at the Gossville school and at the New Orchard Road School in 1899. At that time he was staying with his Uncle Joseph and Aunt Lydia (Thompson) Locke. He then left to attend High School and College. Little is known about his childhood. He claims that "at the age of ten [I] was a veteran trout and bass fisherman, a good boatman, a fair trapper, and an inveterate swim mer. My first real rifle and real dog came to me at the age of twelve after which I was one of the uncrowned kings of the earth." He was small of stature (5'6"), around 150 pounds in weight, and had blue eyes. He attended Yale University, graduating with a BA in 1909. In college he was a cross country runner and a member of the N.Y. A.C. team which won the A. A. U. National Championship in 1905. An attack of appendicitis took him out of athletics and he became an avid amateur photographer. New Haven, May 30 - Arthur O. Friel of Manchester, NH, a Yale sophomore, rooming in Lawrence Hall, was shot down in his room late last night by an unknown man. He had been out to mail a letter and in the absence of his two roommates left the door to his room unlocked. When he returned he noticed nothing wrong and sat down to smoke. In fifteen minutes, he started for his bedroom, adjoining. As he entered the door he received a blow on the head which dazed him. He struck back, however, and his assailant fired at him. The bullet went through his left arm and into the door. When Friel recovered consciousness, his assailant had escaped. He joined the Concord Monitor as a reporter in 1909. From 1911 to 1920, he worked for the Associated Press, and seems to have been in the military in a training camp in Plattsburg, New York in 1916. It is not clear whether he saw active service at the front, or was a news editor in New York when on military service. He came out of the war without getting an officer’s commission, and rejoined the Associated Press. Sometime during this period, he got married to Bessie Genevieve Knowlton, the daughter of Edgar J. Knowlton, a newspaper reporter and two time mayor of Manchester, NH. He turned his attention to writing fiction in 1919, and started contributing to various magazines. Adventure was one of them, where he wrote his popular series about Pedro and Lourenco, two Indian workers on a rubber plantation in the Amazon forest. His other popular series about Ryan, McKay and Knowlton, a trio of explorers in South America also appeared in Adventure before being published in novel form. His treatment of the native population was sympathetic in these, there doesn't seem to have been any racist bias here. He also wrote articles giving tips on photography in the Kodak company's magazine, Kodakery. 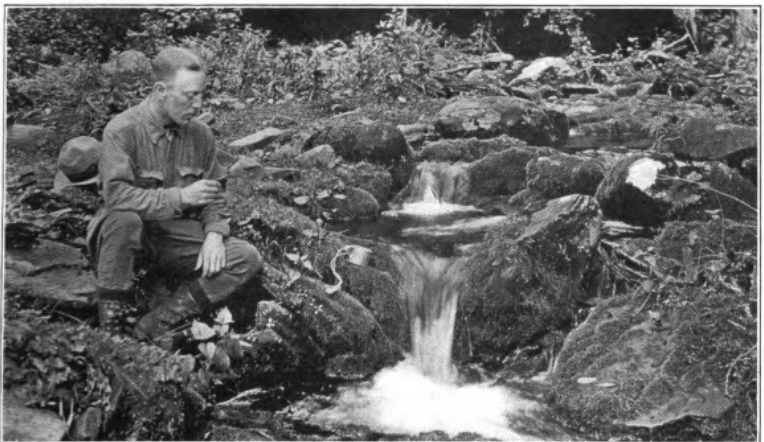 This is one of the photos in that article of him on a 150 mile tramping trip through the Catskills and using a timer to shoot himself (he calls it "My silent partner"). "I was standing in the fore of the boat going up the Orinoco River at sunset one evening. The sun was just setting behind the great hills which the Indians have named the 'Mountains of Mystery'. The flag of Venezuela was blowing in the breeze. On it there are seven stars representing the seven States. That's all there was to it - I had found the name for my book." When talking about his book, he mentions that travel writing is harder than fiction. "I find fiction easier. You have to keep a [travel] diary, take notes and all that sort of thing. Fiction you can chuck in any additional details you feel like. Anyway it takes too long. Why it took me four months working day and night to finish "The River of Seven Stars". The returns are slower. A novel has an immediate run and then it's through. It takes years to get a commensurate amount out of a travel book." The 1920s were his most productive time as a fiction writer, with an average of 5 appearances per year in Adventure during that time. The thirties were much less productive, but he still managed to have one or two stories every year published in Adventure, except 1937, when he had none. He seems to have stopped writing fiction by the time WW2 came around. The decline of the pulps must have been a contributing factor. In “Yesterday's Faces”, Robert Sampson mentions that Friel became the War Editor of the Concord Monitor-Patriot in 1942. However, his draft card from the same time, in the "old men's draft", mentions him being "Self Employed". After that, there is no information about what he did till his death on January 27, 1959. "Arthur O. Friel tells of ferocious tribes in South American Jungles"
or directly from the publisher. Thanks for the link, added your site to my link list too. I like what i see there, even if Blue Book isn't what i collect. I love stories of finding unexpected treasures. Excellent, informative post and really fascinating photos. I'll be a regular visitor of your blog. Thanks! I like having a picture of an author so that i can see whether he fits in his own stories, and it looks like Arthur Friel would fit right in Pedro and Lourenco's South American jungle. Great photos and another big favorite of mine from ADVENTURE and SHORT STORIES. I'll be looking for more from you! Thanks, Walker. I've got plans for an entry on Marion Polk Angellotti, followed by another on Arthur S. Hoffman. After that, as i find more information, i'll keep posting. Thank you for this very interesting blog on Friel. I have been a fan of his ever since, as a teenager, I purchased the Centaur editions of "The Pathless Trail" and "Tiger River." Over the years, I have gathered vintage editions of his other novels and the recent collections from Wildside and Off-Trail. Many years ago, for some reason I don't recall but still regret, I passed over a discard copy of "The River of Seven Stars" at the Providence Public Library. But a few years back, I made an online purchase of that book from a used book dealer in New Hampshire. When it arrived, I was very surprised (and even more pleased) to find it was inscribed by the author as follows: "To W.B. Severance With all good wishes of The Author-Arthur O. Friel." The elegant hand matches the signature reproduced on this page. Congrats on your inscribed copy. 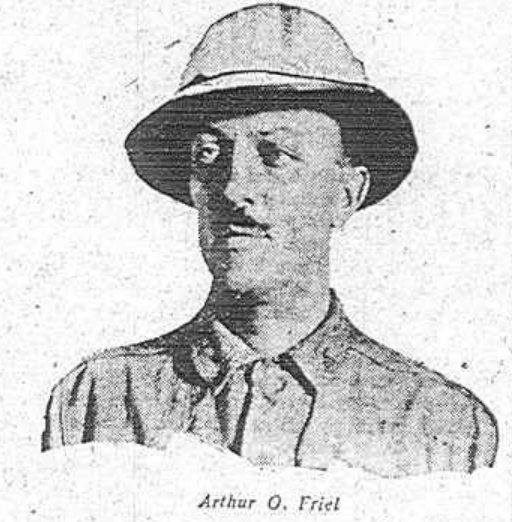 Arthur O. Friel was definitely one of the star writers of Adventure magazine, but he also showed up in Short Stories occasionally. I have enjoyed every story of his I have read so far, and none has been bad. I wonder if you only collect his book appearances or the original short stories in the pulp magazines as well. He's hard to collect; books show up very infrequently on EBay or AbeBooks, and prices are pretty high when they do show up. Thanks. To this point, I have only those short stories that have been collected, as well as the 2 or 3 that are available on online, public domain sites. I'd love to read more. But as you note, the original magazine appearances are pretty pricey when they show up. Maybe someone will publish a collection of his non-series short stories someday. I'd also like to learn more about Friel's life. It was intriguing to read about his pieces in the Concord Monitor-Patriot. They are extant, I presume?